Hydrogen fuel-cell cars will still not be the greenest option for drivers - even after two decades of well-funded development, says a report. The research, from the Massachusetts Institute of Technology (MIT), US, says that diesel and petrol hybrid vehicles will still be the best option at this point, despite the prospect of "aggressive research" on hydrogen fuel. 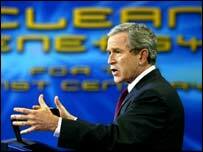 The report undermines the prospects of early success for President George W Bush's recently announced $1.2bn drive to develop commercially viable fuel cell "freedom cars" by 2020. Children born now, he said, might take their first drive in such vehicles. However, it seems likely that even the most advanced hydrogen fuel cell vehicle on the road in 2020 would still not be the most environmentally-friendly option. Hydrogen fuel-cell vehicles are seen as one possible way to dramatically cut the quantity of greenhouse gas emissions at some point in the future. The hydrogen used in the cells is extracted from natural gas, or petrol, and a simple chemical reaction between this and oxygen produces energy. The only by-product of this is water. However, producing the fuel itself would involve substantial carbon dioxide emissions, and the MIT report concludes that these, coupled with the extra "green" costs of fuel distribution, would cancel out these advantages. The MIT team believes that improvements to the efficiency of existing diesel and petrol cars, perhaps by supplementing them with electric motors to form "hybrid engines" would yield the best performance over the next two decades. Aggressive research on a hybrid with a diesel engine could yield a 2020 vehicle with double the efficiency and half the emissions of diesel technology left to evolve naturally, says the report. Dr Malcolm Weiss, from MIT's Laboratory for Energy and the Environment, said: "Ignoring the emissions and energy use involved in making and delivering the fuel and manufacturing the vehicle gives a misleading impression." Dr Peter Wells, a senior research fellow at the Centre for Automotive Industry Research at Cardiff University, UK, said that there was a consensus that hydrogen fuel-cell vehicles would not be viable quickly. 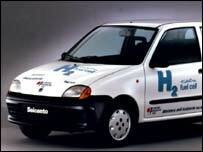 But will hydrogen cars look like this? He said that the "titanic problem" facing the US was that even if one million fuel-cell vehicles were on the road in 2020, their benefits would be dwarfed by 200 million conventional cars. Manufacturers showed no signs of moving away from polluting vehicles such as "light trucks", he said. He added: "There are things that the US Government could be doing now to reduce this problem, not waiting 20 years for hydrogen fuel-cell vehicles." The MIT report, however, does say that in the longer term, there is no alternative to hydrogen so far. Professor John Heywood, one of the authors, said: "If auto systems with significantly lower greenhouse gas emissions are required in say 30 to 50 years, hydrogen is the only major fuel option identified to date." Renewable Energy: Is enough being done?